X Phone will be Born in the USA and designed by y.o.u. Motorola has hinted buyers will be able to customise the design and hardware specs of the still mysterious Moto X handset in a new advert scheduled to appear in U.S. newspapers over the 4th of July holiday. In a new ad, revealed by AdAge, the company promises the device will be "the first smartphone you can design yourself" while boasting that the handset will be assembled on home soil in the United States. Within the full-page ad, the company teases Moto X is "coming soon" and that "users should have the freedom to design the things in life to be as unique as you are." What Google-owned Moto means by 'design yourself' isn't exactly clear yet, but earlier this year Google advisor Guy Kawasaki did (sort of) suggest the device could be personalised like a Porsche sports car. In real world terms, that may mean users could choose colour options, build materials, extra memory, processing power and a wealth of other variables usually determined for them by the manufacturer. In an interview with AdAge, Moto's Motorola's Vice president of Global Brand and Product Marketing Brian Wallace said it was about time those decisions were put back into the hands of the consumer. Without revealing which elements would be customisable, Wallace said: "Smartphones are very different than other tech products a consumer owns. "They're closer to shoes or a watch. You carry it with you everywhere you go. Everyone sees what phone you're carrying and they judge you on it. Yet, it's the one thing you carry that's the least customisable." The ad, which will appear in the July 3 edition of the New York Times, USA Today, Wall Street Journal and Washington Post is nothing if not patriotic. "Imagine what it'll be like when you have the world's best design, engineering and manufacturing talent here in the U.S.," the company purred. "Some people said it couldn't be done. But we're not just any company. And nothing this exciting ever comes easily." 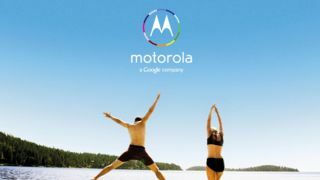 The ad is also the first time we've seen Moto's new Googley logo in any form of public communications.